Ghee can make your Indian dishes sing. If you learn how to make ghee (an Indian version of clarified butter), you can save a lot of money over buying it at the grocery store and still impress friends and family with your gourmet cooking skills. Ghee is the Indian word for clarified butter, which is nearly pure butterfat. Commonly used as oil for frying, ghee has a toasted, nutty taste that will impart a rich flavor to any dish to which it is added. It is commonly used to make Indian dishes such as masalas, samosas and parathas. It is also used to give Indian sauces a thick, silky texture. Since it is almost pure fat, ghee has a very high smoke point and can be cooked to high temperatures before it begins to burn. This is important if you use it to fry foods, as frying requires a higher temperature than standard cooking. Ghee was traditionally made from the milk of buffalo that roamed India and Pakistan; however, these days it is usually made from cow's milk. While ghee is a saturated fat, some consider it a healthier fat source than refined vegetables oils since good ghee can yield little to no lactose (milk sugars). This means that people with a lactose intolerance may find clarified butter easier to digest than regular butter. As always, talk to your doctor before eating anything that you believe may affect you adversely. It's relatively easy to clarify butter, and involves heating it until the milk solids separate from the butterfat. The milk solids are then poured off and the butterfat is reserved for all sorts of delicious culinary uses. Over low heat, melt two cups of butter in a small saucepan. Continue to simmer butter until it begins to separate. Remove from heat and let sit for a few minutes while the butter continues to separate. Strain butter through cheesecloth and into a heatproof bowl, discarding the clear yellow liquid. What you have left is ghee, or clarified butter. Ghee is must for any gourmet chicken. Making ghee is easy, and so is using it. If you're interested in cooking Indian food with clarified butter, here is a simple, rich rice recipe to get you started. The aroma of this dish will make your house smell like a lovely spice shop. In a heavy bottomed pan, melt ghee over a medium heat. Add cinnamon stick pieces, bay leaves and cloves to ghee and fry for one minute. Add onion and sauté for three minutes, or until they are translucent. Add rice and fry for two minutes. Add in salt and pepper, mixing well. Pour in water - be careful-it will splatter! Bring to a boil and cover pot. Cook on low until rice is done, about 15-20 minutes. If you want to know more about how to make ghee and put it to good use, there many great Indian cooking resources on the Internet. Here are a few great links to check out. Food writer and cookbook author Monica Bhide has developed many excellent Indian recipes, many of which are in her new book, Modern Spice: Inspired Indian Flavors for the Contemporary Kitchen. Simple Indian Food is a great source for authentic Indian recipes. 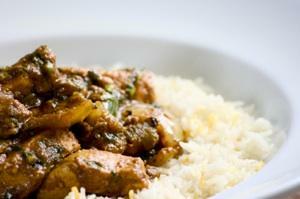 The Art of Cooking Indian Food is an excellent blog about Indian cooking.